This is exactly how I pictured Christmas in Canada. White crunchy frosting everywhere and a hoard of snowmen to form an Arctic version of a zombie apocalypse. 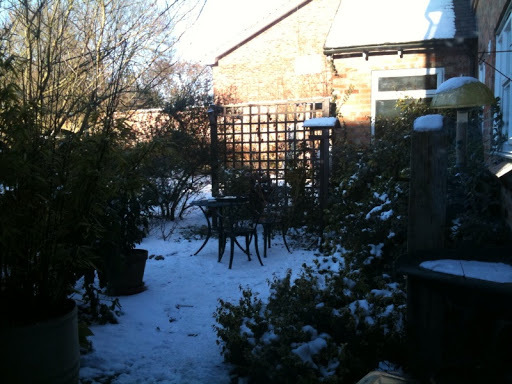 However, the photo is actually of my parents' garden in Leicestershire, since the UK responded to my move north by promptly filling up with snow. It brought a whole new meaning to the old concept that everything you search for is in your own backyard. Literally. The real question is though, was this a white Christmas? Let's consider the facts: It was (1) Christmas Day and (2) white. You might think that this was rather damning evidence and that it was a straight-forward done deal. Apparently, the official criteria for a white Christmas is that a single snowflake must fall in the 24 hours of the 25th December anywhere in the UK. So in fact, everyone could be up to their necks in snow and living in igloos due to brain-eating Frostys having invaded their kitchens and it could still not be an official white Christmas. Conversely, London could be improving their tans, but if that solitary snowflake lands on a bag pipe in Edinburgh, a white Christmas it be! The Met Office web pages reveal nine 'Official white Christmas monitoring sites', one presumes for the people who have decided to bet their life savings / house / pet dog / first born on it being a white Christmas in a particular year. These locations are Aberdeen Football Club, Aldergrove Airport in Belfast, the Bullring mall in Birmingham, Millennium Stadium in Cardiff, Edinburgh Castle, Glasgow Cathedral, Albert Dock in Liverpool, Buckingham Palace and Granada Studios in Manchester. Presumably, people are hired for this snowflake counting. It could be quite lucrative, if not in over-time pay, then in bribes from people whose partner has bet their eldest son. So was 2010 a white Christmas in the UK? Second children everywhere are disappointed.